Reykjadalur hot spring in Hveragerdi. Flights arrive here around 5 a.m. With just three full days, we decided to stick to the southwest part of the country, home of Reykjavik, the Blue Lagoon, and the majority of Iceland’s population. Driving in from the airport, the dramatic landscape looks like a movie set. Volcanoes give Iceland its identity — geysers, hot springs, craters, valleys. It’s hard to take your eyes off any of it. 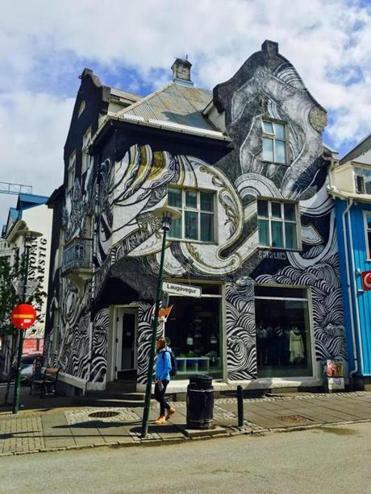 We soon arrived in Reykjavik — rested up, then roamed the streets. That men’s magazine? It was right. But it’s not just the women— everything here is gorgeous. But we’re not here to ogle: We’re here to hike, bike, eat, drink. Maybe squeeze in some conventional sight seeing. It’s one thing to look at the jaw-dropping majesty of the Icelandic coast — it’s another to live it — and an ATV tour through the mountains and black sand lava beaches is about as close as you can get. We took a two-hour tour, and given the harsh, jumpy terrain, that was plenty. The tour starts about an hour south of Reykjavik in the seacoast town of Grindavik. It’s pricey, about $200 per vehicle, but it’s worth it. By the end of the trip you are adrenalined out, tired, and a bit sore. The perfect set up for the next stop. The Blue Lagoon is central to Iceland’s identity. Yes it’s touristy and crowded, but for the same reason a good restaurant has a wait, it’s worth it. Blue Lagoon sits in the middle of a lava field, water temps are about 100 degrees, and you float and glide through the light blue water as steam wafts above your head. There are swim up bars and facial salons. It is soothing, relaxing, and just 45 minutes from Reykjavik. The spa itself is clean, efficient, heavenly. There are a handful of really good hikes within an hour or so of Reykjavik. We chose the Hveragerdi trail. The star attraction of this hike is the Reykjadalur hot spring near the top of the mountain, about 2 miles into the hike. Iceland’s weather turns on a dime, particularly in the mountains. Smart, seasoned travelers know to prepare for a hike like this. We were not among them. There was a slight breeze and small drizzle at the start of the hike, so we wore jeans and thin parkas. After making the trek to the hot spring, we stripped, jumped in the hot water, and stayed for about 20 minutes. But we didn’t bring towels. And then the rain/windstorm hit. Walking down the mountain in wet clothes, being pelted by a hard rain and stinging winds, passing hikers in full North Face gear would smile at us with a mixture of pity and bemusement. At the bottom of the mountain, we decided it was time to scale down the outdoorsy stuff and try a taste of Reykjavik. Have you ever seen the little puffin bird? Shiny white breast, adorable orange beak, just delightful to look at — but they’re even better sautéed. Yup, this lovely little bird, which the Natural Resources Defense Council wants to protect, is a delicacy in Iceland, which has the largest puffin breeding colony in the world. I felt a bit guilty taking my first bite, though not as bad as I felt earlier in the day when I wolfed down my first reindeer burger (delicious), or later that night when I finished off dinner with a minke whale steak. Iceland, for all it’s progressive tendencies (the country has 100 percent renewable electricity), is clearly gastronomically incorrect. We drew the line at eating Mr. Ed. Yes, they serve horse steaks in Iceland, but we just couldn’t go there. We were able to wash away our food guilt at a number of bars and clubs. Most are clustered on Laugavegur Street. Icelandic Bar was a favorite, with good food and animated bartenders. Another, just down the street, is the local sports bar, Bjarni Fel. We popped in there one night, if you can call it that. It was 10 p.m. but the sun was still cracking through the clouds. “It’s like it’s always 5 o’clock here,” says Brian Plouffle, a Worcester native who was partying his way through Sweden and Iceland with a couple of friends. “It’s an endless happy hour.” But whisky and beer are pretty expensive here. I have a beer-and-burger test when evaluating cost of living. Iceland flunked. We paid $70 for two burgers and two beers at a pub. That’s pricey by any standard. The Golden Circle drive is a necessary jaunt in southwest Iceland. It’s a 150-mile journey that connects three of the most compelling spots in the country. The most dramatic were the large pounding waterfalls at Gullfoss, a true spectacle of nature. The falls produce misty waves and spectacular rainbows. Farther down the road, the main geyser at Haukadalur geyser erupts every 10 minutes and shoots about 100 feet into the air. It’s best to trek up the mountain behind the geyser and view from afar. The long ride had us thinking about beer and whale testicles. Fortunately, the Stedji Brewery, an upscale tasting room, combines the two. This small microbrewery, set in the beautiful hill country of Borgarfodur, makes specialty brews, but none so special as whale testicle. The beer is an homage to Iceland’s traditional dishes, says owner/brewer, Dagbjartur Arliuson. The testicle is mixed in during the brewing process to give the beer a smoky, meaty taste. The result is pretty good, full-bodied, rich, not bitter. It’s everything you could hope for in a whale testicle beer. The brewery was our last stop before heading home. WOW Air is a super discounter, but that means cramped seats and paying for everything. It’s best to just try to sleep through it, not a difficult task given our schedule and our midday libation.